I have thought a lot about light recently. As followers of Jesus, we are to live as children of the Light. Our Light is the Lamb of God, Jesus, Our Savior. 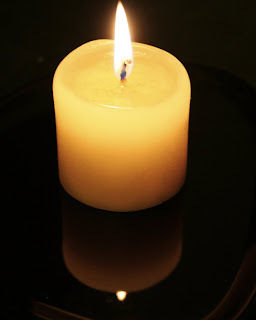 When I think of "light", I think of a candle. A candle stands with its flame exposed to the surroundings, completely vulnerable. This picture is a great parallel to how we should live our lives. Vulnerable, exposed, ready to experience the environment around us while we stand confident that our Light is an everlasting light. This is a little scary, or maybe really scary, thinking about risking our reputation, well being, health, comfort, etc. But if we want to live as Jesus lived (which we can because we have His Spirit living in us), then we have to live in the Truth of who we are, good or bad. So, as we live in the Light, more Truth will be exposed, not only in us but others as well. Don't hide your candle under a bushel! So true... I see little Lily who I babysit hold up her little finger as we sing this little light of mine. (She is the same age as your Lucy) Her NO is so strong... NO. Our NO should be just as strong. I Love this symbolism and writing. Thank you for sharing it.